On Two Against Nature Steely Dan's brilliant new Giant Records release, Donald Fagen and Walter Becker have returned to the studio for the first time since 1979's multi-platinum album Gaucho with a collection of new originals and an all-star cast of supporting players. 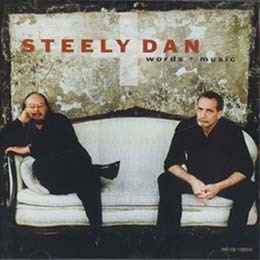 The result: a quintessential musical blend that consolidates Steely Dan's reputation as one of the most innovative and original songwriting and producing teams of all time. This edition of Words + Music features an exclusive interview with Donald Fagen and Walter Becker of Steely Dan and tracks from their new Giant release, Two Against Nature. With their trademark synthesis of rock, jazz and musical elements wholly their own, Two Against Nature continues a tradition that began with such landmark hits as "Do It Again," "Rikki Don't Lose That Number" and continued through "Peg," "Hey Nineteen" and many more. Now, after twenty years, Steely Dan picks up where they left off with Two Against Nature, which includes such standout tracks as "Gaslighting Abbie," "Jack Of Speed" and "West Of Hollywood." It's most definitly been worth the wait.